A Russian fighter jet flew dangerously close to a U.S. RC-135 reconnaissance aircraft on Thursday in the latest military provocation by Moscow over the Baltic Sea, the U.S. European Command said Saturday. "On April 14, a U.S. Air Force RC-135 aircraft flying a routine route in international airspace over the Baltic Sea was intercepted by a Russian Su-27 in an unsafe and unprofessional manner," said Navy Capt. Danny Hernandez. "This intercept comes shortly after the unsafe Russian encounters with USS Donald Cook," he added. "There have been repeated incidents over the last year where Russian military aircraft have come close enough to other air and sea traffic to raise serious safety concerns, and we are very concerned with any such behavior." Hernandez said the U.S. aircraft, a militarized Boeing 707 jet, was operating in international airspace "and at no time crossed into Russian territory." "This unsafe and unprofessional air intercept has the potential to cause serious harm and injury to all aircrews involved," he said. "More importantly, the unsafe and unprofessional actions of a single pilot have the potential to unnecessarily escalate tensions between countries." According to Hernandez, the Su-27 carried out "erratic and aggressive maneuvers" by approaching the RC-135 at a high rate of speed from the side. The Russian jet "then proceeded to perform an aggressive maneuver that posed a threat to the safety of the U.S. aircrew in the RC-135U," the spokesman said. "More specifically, the SU-27 closed within 50 feet of the wing-tip of the RC-135 and conducted a barrel roll starting from the left side of the aircraft, going over the top of the aircraft and ended up to the right of the aircraft," he said. The U.S. government is protesting all the incidents this week to the Russian government through diplomatic channels, he said. The RC-135U, an electronic intelligence-gathering aircraft, is normally operated by five air crew and up to 16 electronic warfare officers and six or more regional specialists. The dangerous aerial incident came two days after a simulated Russian aerial assault against the guided missile destroyer USS Donald Cook in the Baltic Sea. Washington called the simulated assault a military provocation, and said it nearly caused an international shootout. Two Russian fighter-bombers, identified as Su-24s, made close passes over the Cook, including one jet that came within 30 feet of the warship. A Navy officer said the buzzing was the most reckless flyover of a U.S. warship by either a Russian or Chinese warplane since the Cold War. "I’ve been in a lot of those situations and I’ve never seen any plane come that close," the officer said. The aerial harassment appears to be part of a Russian military campaign of intimidation against the United States and NATO. Moscow has adopted hostile military policies toward the United States over U.S. deployment of missile defenses in Europe, which Moscow says threaten its missile forces. The Russians also have been upset by Western sanctions against its military annexation of Ukraine’s Crimea. Strategically, Russian leader Vladimir Putin has been seeking to regain control and influence over what Moscow calls the "near abroad"—former Soviet republics and Eastern Bloc nations along the periphery of Russia’s borders in Eastern Europe. The policy has led to military aggression against the Republic of Georgia in 2008 and Ukraine in 2014, where Russian troops took over the Crimean peninsula and are continuing to fuel separatist activity in eastern Ukraine. In response, the United States and NATO are bolstering U.S. and allied military forces in Eastern Europe, with a specific emphasis of increasing military forces and troops near the Baltic states of Latvia, Estonia and Lithuania, as well as in Poland. The recent Russian military provocations coincide with military activities by Moscow in the Russian enclave of Kaliningrad, which remains a major subject of U.S. monitoring. Russia in the past has threatened to deploy nuclear-capable Iskander short-range missiles in the enclave on the Baltic Coast between Poland and Latvia. Earlier this week, Brian McKeon, principal undersecretary of defense for policy, told a House subcommittee hearing that Russia has prevented U.S. and allied flights over Kaliningrad that are allowed under the Open Skies Treaty. Mark Schneider, a former Pentagon strategic forces analyst who specializes in Russian affairs, said the recent incidents over the Baltic Sea, including the simulated attack of a U.S. warship, are fundamentally different from past Russian provocations. "It is a major escalation of Russian aggressiveness although it fits into a pattern of Russian activity that goes back years," Schneider said. "The Russian Defense Ministry reaction was blatantly dishonest." Schneider said the likely U.S. response to these provocations are what former Pentagon official Richard Perle once dubbed "demarche-mellows," or very weak, pro forma protests. "If so, incidents like this will probably continue to escalate," Schneider said. 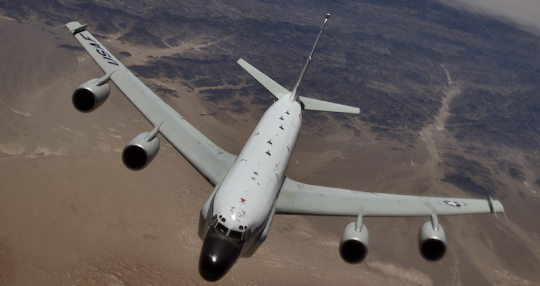 Thursday’s aerial encounter involving the RC-135 was at least the second time this year that Russian jets have conducted a dangerous intercept of a reconnaissance aircraft. On Jan. 25, a Russian Su-27 came within 20 feet of an RC-135 over the Black Sea in what Navy Capt. Daniel Hernandez said was an "unsafe and unprofessional" action. Unlike Thursday’s encounter, the Russian jet in January did not do a barrel roll, but instead made an aggressive, high-speed banking turn away from the intelligence aircraft. The maneuver disturbed the pilot’s control of the RC-135. The dangerous Su-24 overflight of the Cook on April 12 came a day after two other Russian Su-24s flew over the ship 20 times, including a dangerous pass as an allied helicopter was being refueled, causing a delay in flight operations until the Su-24s left the area. The same day, a Russian Ka-27 Helix helicopter flew around the Cook, which had finished a port visit to Poland and had a Polish helicopter on board. "The Russian aircraft flew in a simulated attack profile and failed to respond to repeated safety advisories in both English and Russian," the European Command said in a statement. The Pentagon released video of the encounter showing the close pass, which created a wake in the water. Secretary of State John Kerry on Thursday criticized the Russian military provocation, though he declined to say what steps the United States would take in response. The State Department lodged formal protests with Russia. "We condemn this kind of behavior. It is reckless. It is provocative. It is dangerous. And under the rules of engagement that could have been a shoot-down," Kerry told CNN and the Miami Herald. "People need to understand that this is serious business and the United States is not going to be intimidated on the high seas. … We are communicating to the Russians how dangerous this is and our hope is that this will never be repeated," Kerry said. The Cook is equipped with anti-aircraft defenses including the Close-In Weapons System, an automated air defense gun that can destroy aircraft with 25-millimeter rounds. The weapon was not readied because the ship was operating under the U.S.-Russian agreement not to illuminate each other’s aircraft. "We have deep concerns about the unsafe and unprofessional Russian flight maneuvers," the European command said in a statement. "These actions have the potential to unnecessarily escalate tensions between countries, and could result in a miscalculation or accident that could cause serious injury or death." Kerry on Friday discussed the Cook incident with Russian Foreign Minister Sergey Lavrov, a State Department spokesman said. Moscow sought to play down the incident involving the Cook. Russian Defense Ministry spokesman Igor Konashenkov told the state-run Interfax news agency that the Russian pilots acted within safety guidelines. The incidents violated the bilateral U.S.-Russian agreement designed to prevent incidents at sea. The accord prohibits conducting simulated attacks and also limits the use of automated anti-aircraft guns. Other incidents in recent months included a near collision between a Russian fighter and an RC-135 over the Black Sea on May 30, and on April 7, 2015, a Su-27 flew within 20 feet of an RC-135 over the Baltic Sea. Additionally, last October, two Russian Tu-142 bombers made low passes near the aircraft carrier USS Reagan as it sailed in the Sea of Japan near the Korean peninsula. And on July 4, 2015, two Tu-95 nuclear-capable bombers approached within 40 miles of the California coast and radioed a "happy birthday" message to intercepting U.S. pilots. The July 4 provocation occurred the same day President Obama held a telephone call with Putin. Russia also has sent Tu-95 bombers to circle the Pacific island of Guam several times. The island is a major military hub and central to the U.S. military’s pivot to Asia. This entry was posted in National Security and tagged John Kerry, NATO, Russia. Bookmark the permalink.